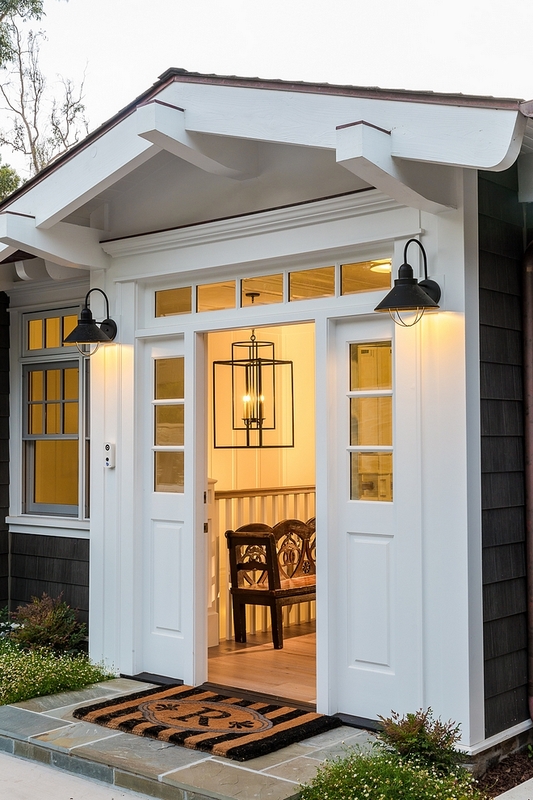 This single cottage features 5 bedrooms and 5,700 square foot of living space. 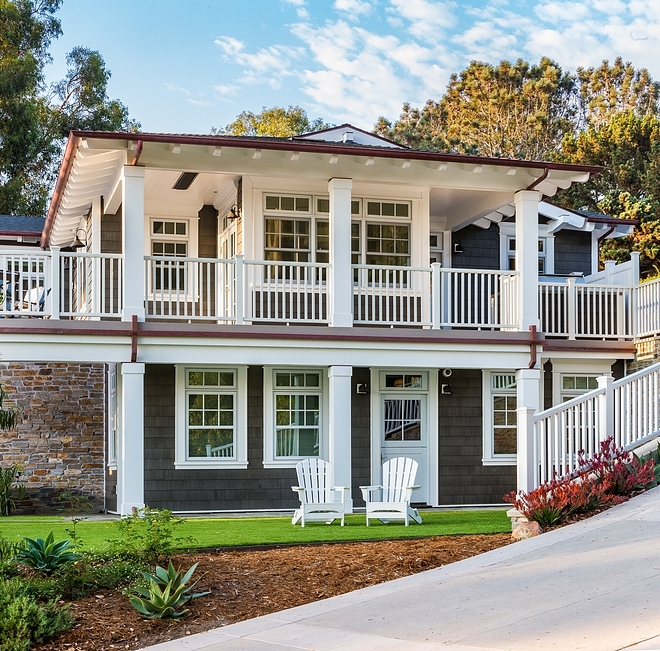 It’s located in Olde Del Mar, CA and the house is ideally situated on a 1/3 acre promontory with spectacular Pacific Ocean views. 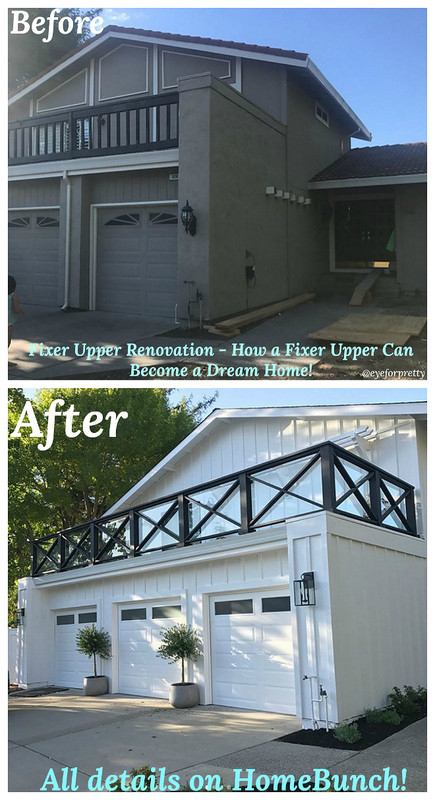 It took the homeowners and Flagg Coastal Homes, two years to obtain building permits under California’s and the City of Del Mar’s ever tightening zoning and approval regulations. The homeowners’ persistence and cooperation with their uphill view-affected neighbors was instrumental in obtaining the building permit. 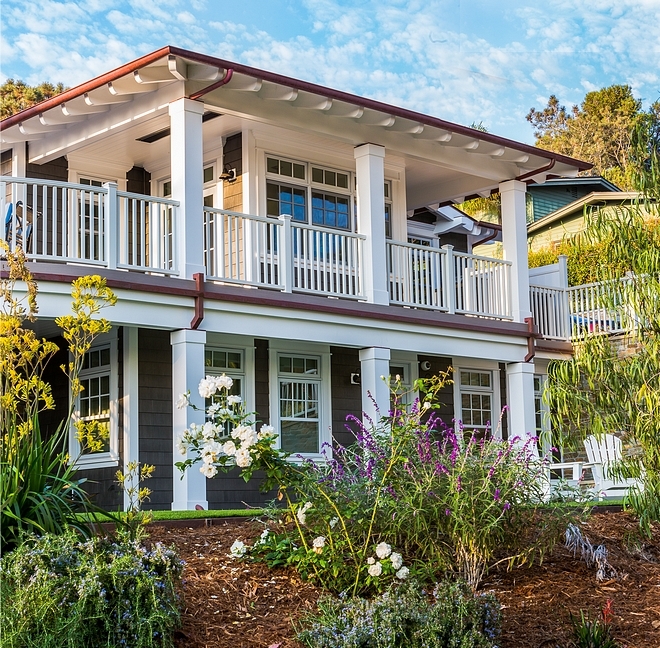 The result of their patience, good taste and Flagg‘s years of municipal approval experience yielded this single cottage in the new California “Island Coastal Style”. 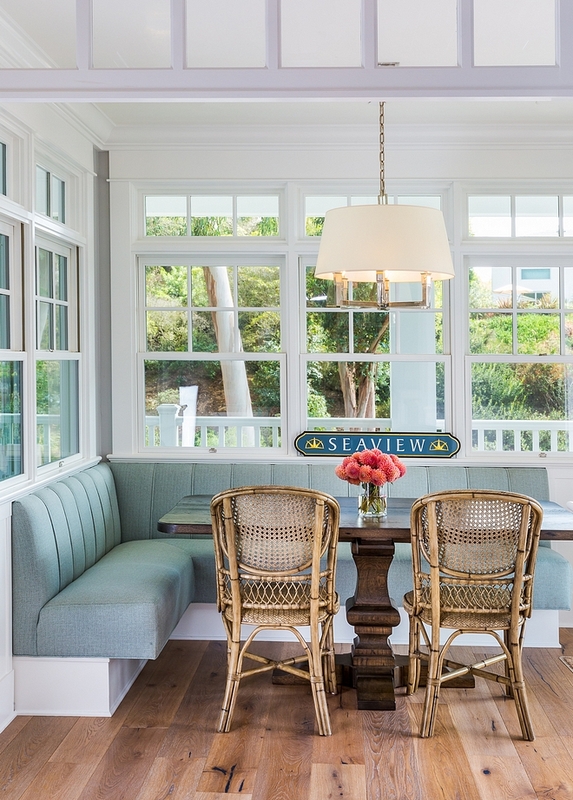 The beautiful interiors are by Coastal Dwelling. Besides having a beautiful ocean view, this home is surrounded by nature. There’s something so calming and peaceful about this place. Similar white adirondack chairs: Here, Here & Here. Roof: GAF Timberline 30 Year in Charcoal. Front Door: Custom-designed, built of solid wood, painted. Similar Foyer Lighting: Here, Here & Here. 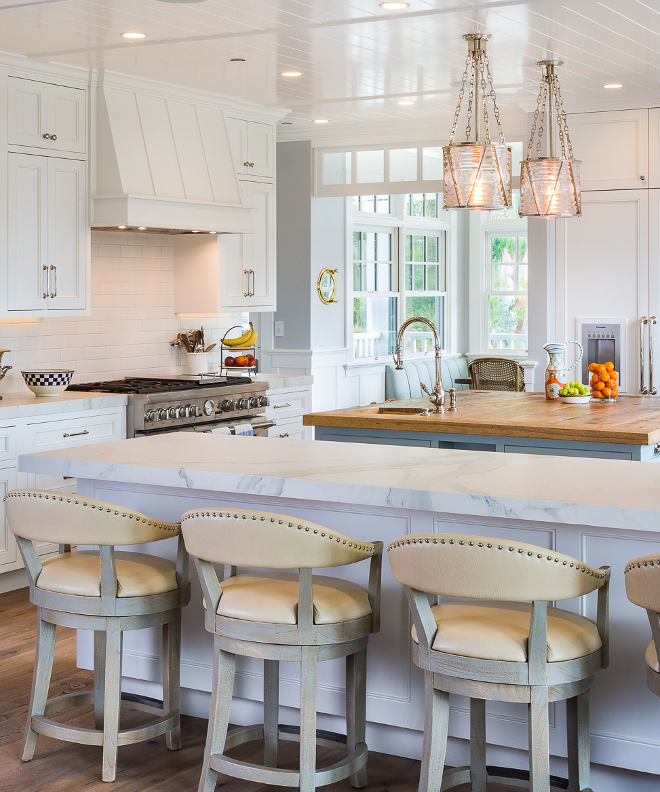 This white kitchen features an inspiring layout and plenty of millwork details. 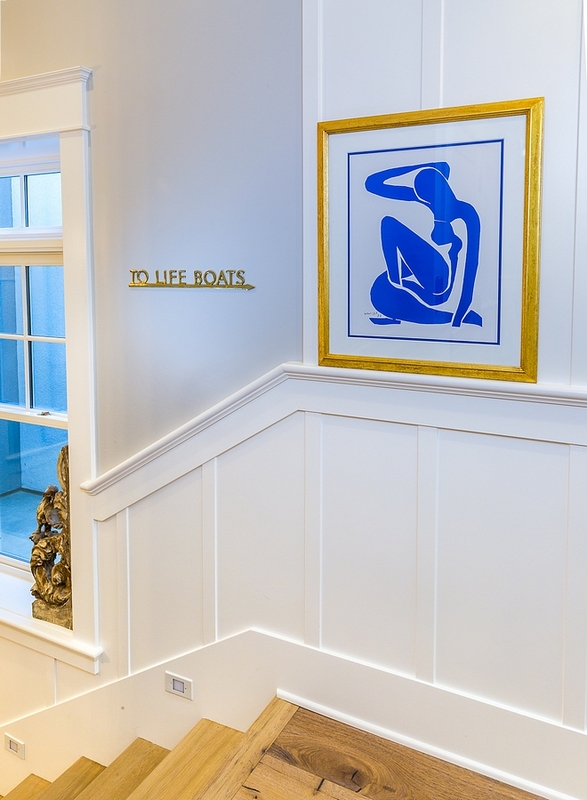 Wall paint color is Saltaire RL 4344 by Ralph Lauren at 50%. Kitchen Backsplash: Ann Sacks 3×8 MADE tiles in Color: White Shimmer #M2020 – similar here – different size. Tile size: 3×8 x .350- handmade in Portland – *the nature of the product is handmade, recommended grout joint is 1/8” – The tiles were staggered at 1/3. 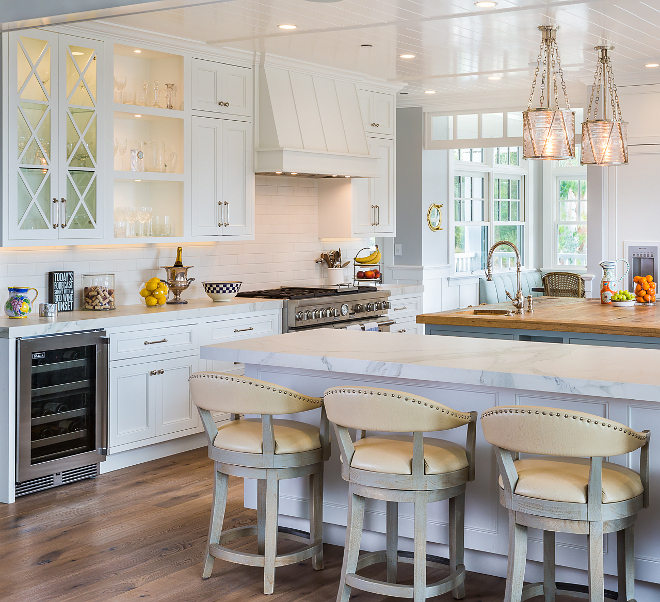 Kitchen features a large peninsula and a very practical prep-island in the middle. Kitchen Countertop: Porcelain Callacatta Maximum by Ann Sacks. Counterstools: Custom – similar here, here, here, here & here (backless). 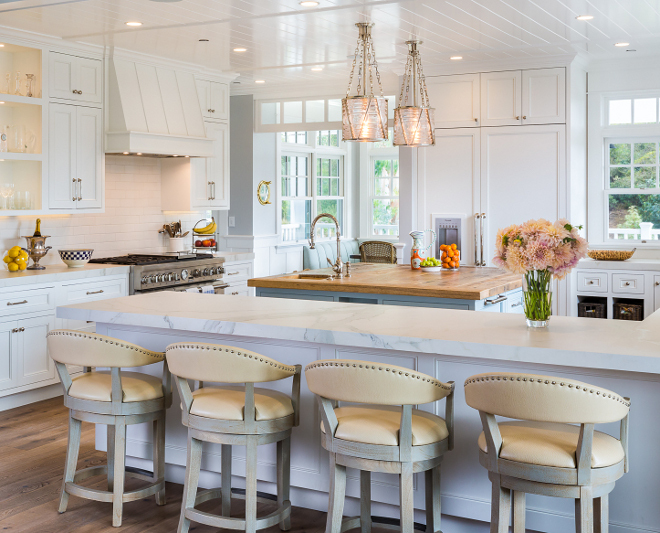 White Kitchen Paint Color: Designer White by Pratt & Lambert. 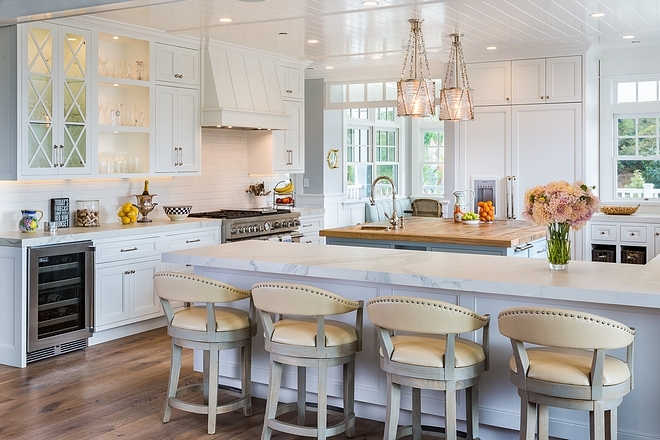 Kitchen Cabinet: Wood Custom Cabinetry Designed by Rebecca Lincoln, Coastal Dwelling. Cabinet Style: Full Inset with Cascade Style Doors. The ceiling height is 9′. 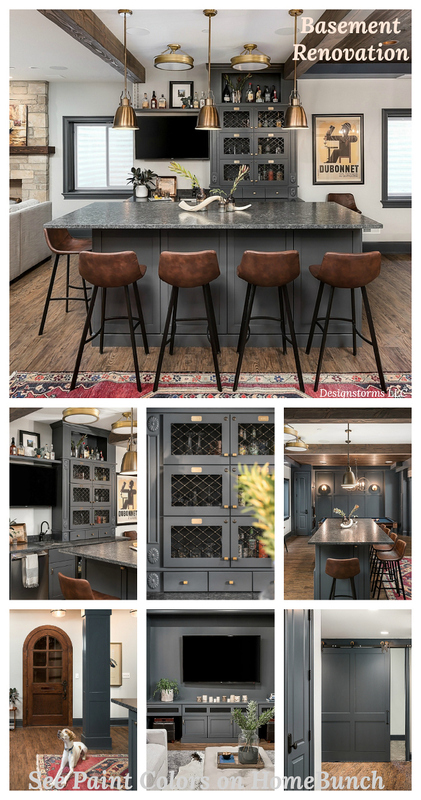 Blue-grey Kitchen Island Paint Color: Tracery Gray RL 4372 by Ralph Lauren. 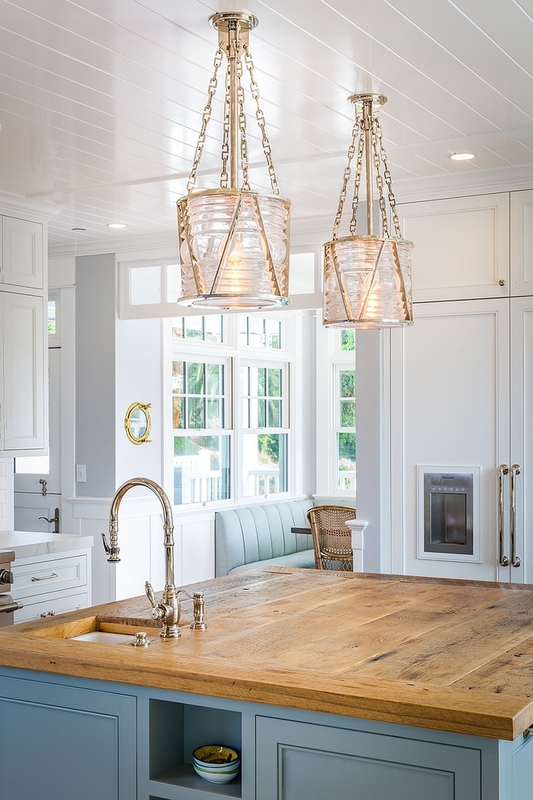 Lighting: Visual Comfort – these are one of my favorite pendants by Visual Comfort. 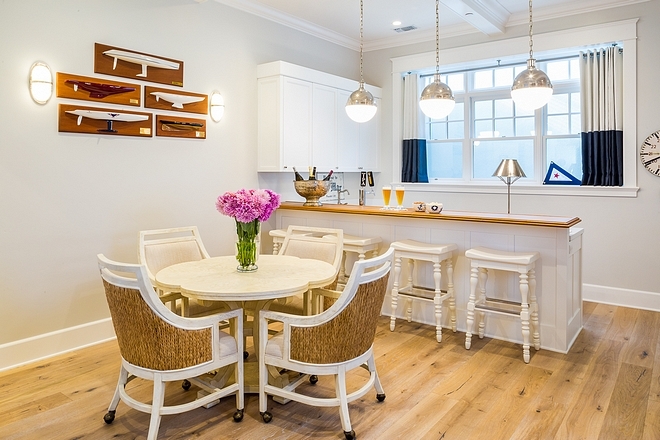 The island features custom reclaimed wood countertop. 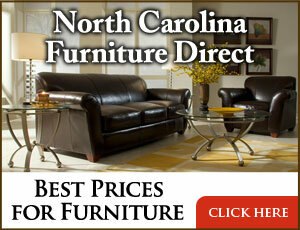 Cabinet Hardware: Ashley Norton Hardware – similar: Appliance Pulls, Drawer Pulls & Knobs. 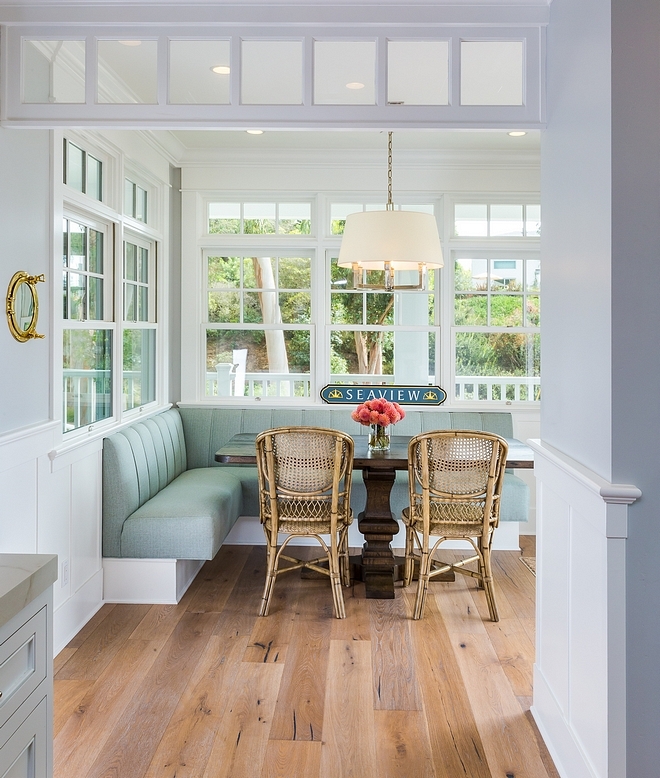 Leaving the kitchen, you will find a cozy breakfast room with hardwood floors, custom banquette and plenty of windows. 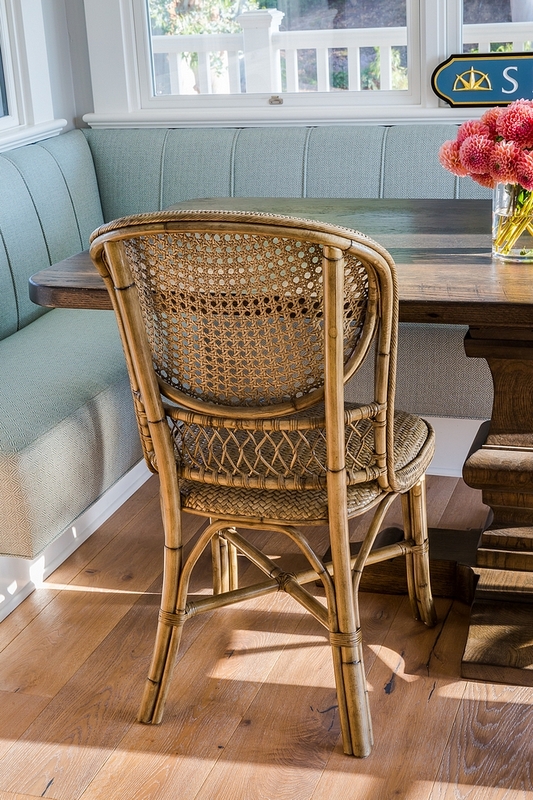 Dining table is custom – Small dining table: here & here. White Oak Hardwood Flooring: DuChateau Danube Oil Finished. Master Slab: Ann Sacks – Pearl Limestone– multiple sizes available in 3⁄4” (2CM) slab by Ann Sacks – Slabs were added to tub deck, bench, vanity and on sills of niche in shower. 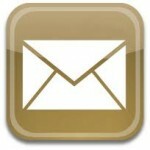 Ceiling Lighting: Visual Comfort – size: medium – polished nickel. Faucet: Rohl Perrin & Rowe. Bathroom Cabinet Style: Full Inset with Cascade Style Doors. Bathroom Tile: Ann Sacks Main Floor: 16×24 Reve Blue Stone Herringbone pattern to seal natural stone with a penetrating sealer/dry lay out stone prior to installation. Shower Pan & Floor Pan: Reve Blue Marble cut to 4×4 straight lay + Floor 16×24 Reve Blue Marble mosaic. Border: Calacatta as a border. 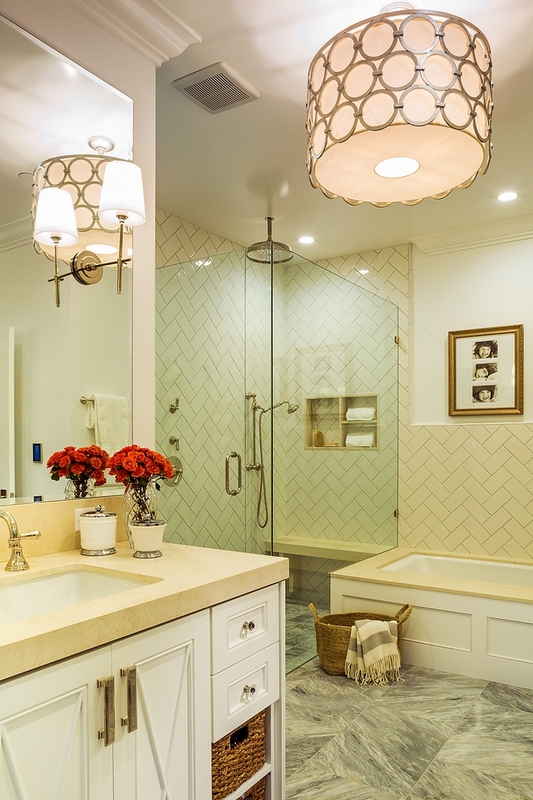 Shower Walls: & Wainscot in W/C: Savoy Series Porcelain 4×8 Color: Ricepaper Set as Herringbone pattern –also behind tub Same tile to be used in W/C but laid horizontally with an offset grout joint. Trim: Savoy Box liner in Ricepaper at shower and tub. 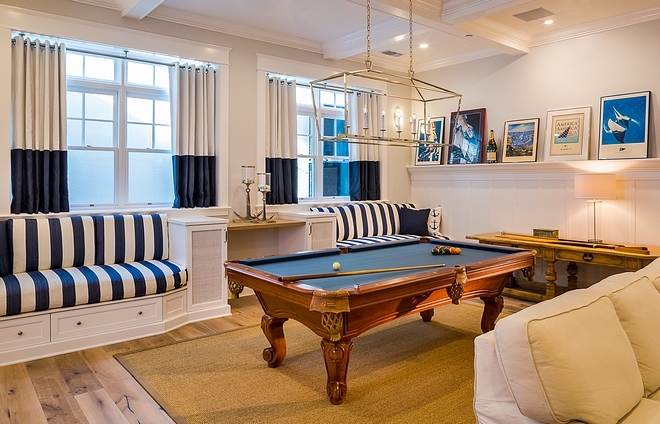 The basement carries the coastal feel we see in the other parts of the house. Paint color is Faded Gray by Dunn Edwards. 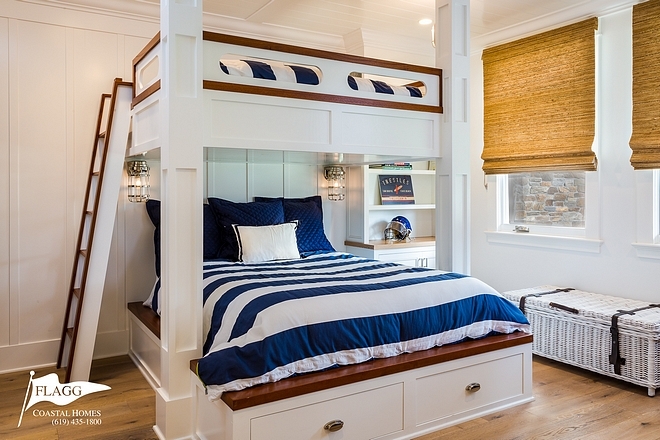 Board and batten paneling and custom bunk beds are painted in Designer White by Pratt & Lambert. 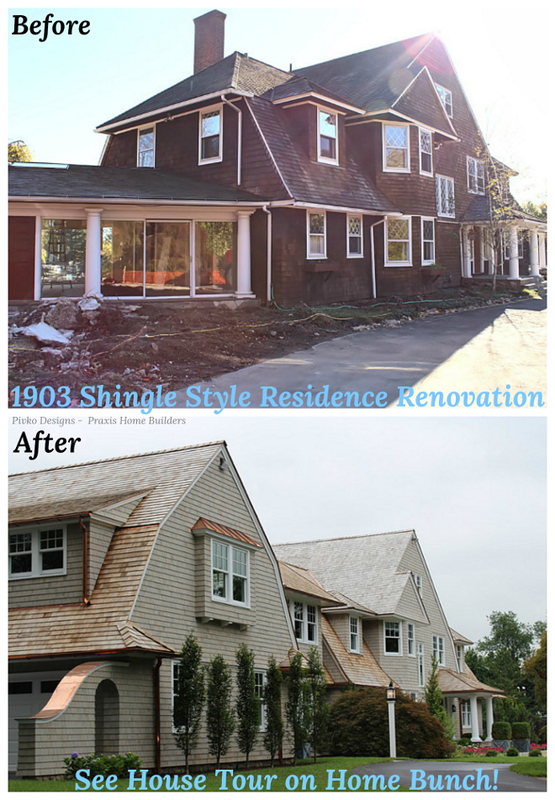 Shingle Siding: Allura Perfection Shingle in Slate color. 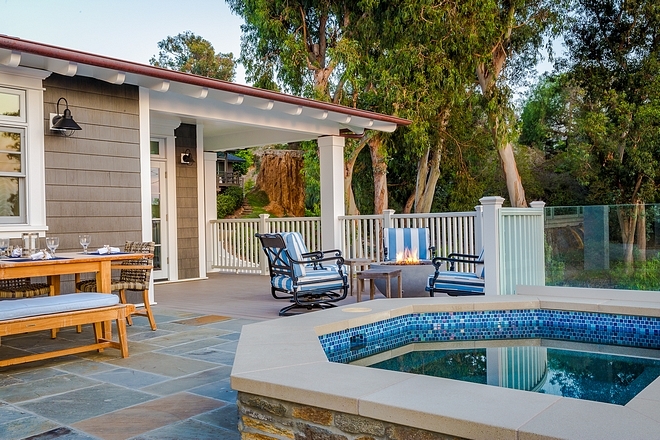 A gorgeous ocean view can be enjoyed from this extensive upper deck with spa. 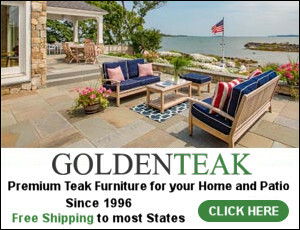 Outdoor Furniture: Frontgate & existing pieces. 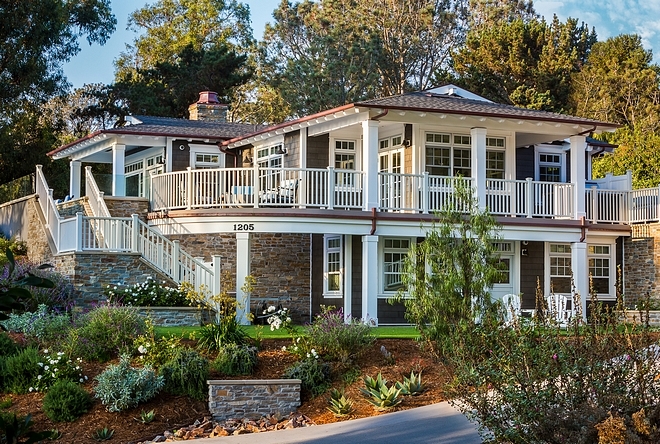 Builder: Flagg Coastal Homes (Instagram). Interior Designer/Project Manager: Coastal Dwelling. 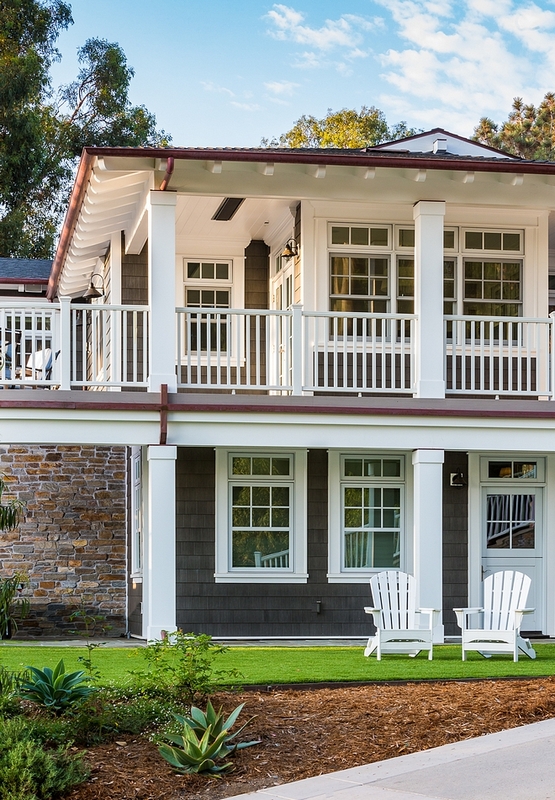 Posts of the Week: New-construction Farmhouse with Front Porch.